On Wednesday, September the 12th, 2018, the Wind Dice Magician (Morris) Hall of Heroes was announced. This is great, especially because of the new Labyrinth, which requires revivers and healers galore. I have a Morris in storage right now, and I haven’t had time to mess with him but after this I think I will build him. You’ll learn in a second why Morris is so good. Yes! He’s one of the best of the Dice Magician Family, and let’s get into why by briefly going over his skills: his passive skill, To Live or To Die, will have him roll 2 dice at the start of each of his turns if an ally is dead. If he gets two dice of the same number, he’ll revive all dead allies, and the higher the numbers on the dice are, the more HP they’ll be revived with. That means if he rolls a 2, they’ll be revived with, say, 20% HP and a 6 would be 60%! Rune Recommendation: Violent + Any set, SPD/HP%/HP%. Welcome to stage 1; the world of infinite proccing and dice rolling has just begun. Here, we have three Renos (water Dice Magician) and two Cichlids (wind mermaids). Cichlid’s also pretty annoying to deal with, too. Her third skill Crushed Hopes will attack an enemy three times. The first attack removes beneficial effects, the second hit decreases their defense for 2 turns, and the third attack increases the cooldown of all the enemy’s skills for 2 turns. That means if you’re unlucky enough and she targets your healer, then you’re going to be unable to heal yourself or any others for a few turns. Let’s also not mention that the attacks hurt, too – there is a very good chance of Crushed Hopes being able to one-shot someone. The Solution: Kill Reno first. While Cichlid does have skill cooldown increase, Reno has AoE potential to ignore defense. That makes him more dangerous than Cichlid. While that’s true, Cichlid still isn’t a damsel in distress. Her second skill Air Shield is a complete cleanse on someone and then a three-turn shield equivalent to 20% of her Max HP. So what do you do while you’re busy killing the Renos? Stunlock the Cichlids! If you just keep both mermaids stunned, then they won’t be able to do anything until the main threats are dead, and then you can work on chipping away their HP. Once the five mons on this wave are dead, then you can move on to stage 2. Alright, it’s time for budget Theomars and budget Tiana to take the stage! Here we have three Ludos (fire Dice Magicians) and two Sohas (water Nine-Tailed Fox). The Threat: So I actually have a Soha to mess around with – six-starred and everything – and what I’ve learned is that she’s great as a Faimon farmer, a budget stripper in the arena, and is probably one of the real MVPs in the Fire Rift. 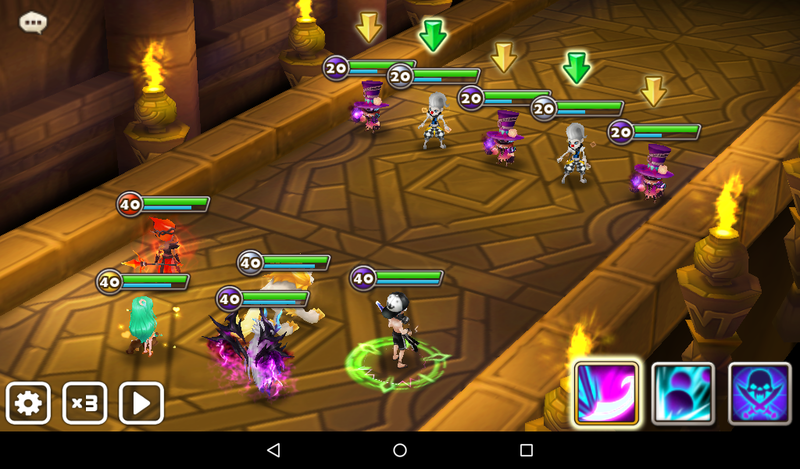 For those who are unaware: Soha and Aquila (and more or less the new dark Dryad Hyanes) are the only four-star monsters who have an AoE beneficial effect remover skill. Soha’s third skill, Cleanse, attacks all enemies and removes all their beneficial effects of them, before removing one harmful effect off of all her allies. This not only makes her a pretty cool AoE buff remover, but also as a mini-cleanser. Her second skill Soul Snatcher really hurts, too. But let’s talk about Ludo now. Ludo’s passive skill will have him roll dice at the start of each turn. The damage he grants will increase up to 70% of the number is large, and the damage he takes will be reduced up to 70% if the number is small. In other words, if he rolls a 6, then the damage he grants will be 70% and the damage reduction will be a mere 20%. In other words, he can really hurt. The Solution: Kill Soha first. I cannot stress this enough; Soha can strip all your buffs and then cleanse her allies! That stun on Ludo? Oops, it’s been cleansed. Your Fran just cast Fairy’s Blessing? Well, that attack power and immunity’s gotta come off, girl! …Sorry, I got a little carried away. But my point still stands; you have to kill Soha first before you can work on Ludo. The Threat: If we’re talking Crowd Control threats from the enemy, I’d say Clara. If we’re talking getting one-shotted when your Charlotte was at Max HP but then Xing Zhe used Lightning Monkey Wand on her and then she was dead and you didn’t bring a reviver to this HoH so you have to quit the run because your main damage dealer is dead, then I’d say Xing Zhe. I think my personal experience with Xing Zhe speaks for itself, so I’m gonna talk about Clara for a little bit. Her third skill, Wheel of Fire, attacks all enemies three times and stuns them for one turn. The main gimmick of the Pierrets is that their third skills does something extra when used at full HP, so in Clara’s case, her third skill can elongate harmful effects per hit when used at full HP. I am not kidding, that happens way too often. 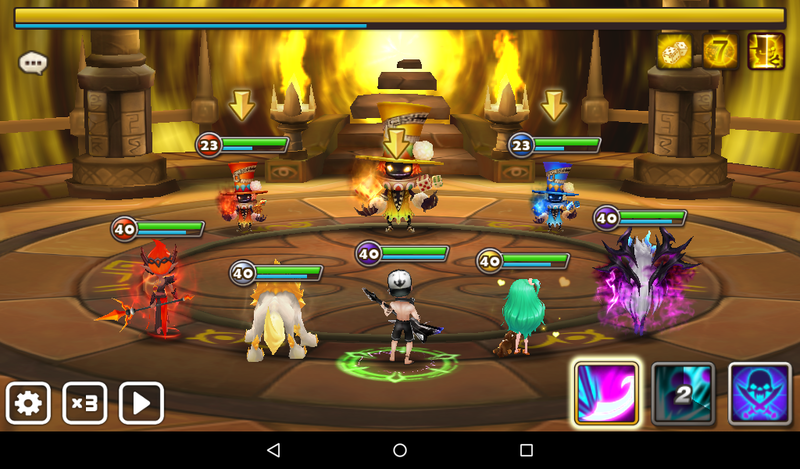 It stops getting funny the fourth time all of your monsters have four-turn stuns. The Solution: Did you know that you can just kill the miniboss and boss of the Hall of Heroes without having to take out the lackeys now? That mains you can directly focus on Xing Zhe now. 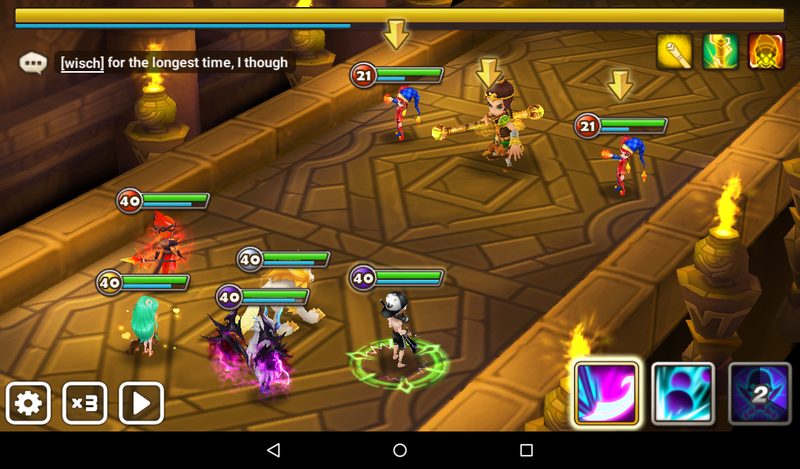 If you want to be extra-safe, attack both Claras once or twice so that they’re not at full HP and therefore cannot go and stun your mons for four turns in a row. The Threat: Tablo. Tablo, Tablo, Tablo. I swear, I hate his third skill, “Returned Dice.” His third skill resets everyone’s attack bars (meaning the enemies and the allies get their attack bar reduced to 0), granting all of his allies a speed buff for 1 turn, and then stuns himself for 1 turn. His attack bar decrease and stun can’t be negated by Immunity and ignores resistance. The Solution: Go for Tablo first, I kid you not. He has screwed up the attack order of my team more times than I can remember, I hate him so much. Once Tablo’s been…taken care of, then you can easily go for Dusky. His shield doesn’t absorb much damage, so you’re good there. Now we can move on to stage 5! The Threat: This stage is really just an annoying stage. I see nothing that can outright kill you, unless we’re talking about Monte’s second skill. It’s more about stalling you every now and then. Figaro’s passive, “Camouflage” will have him cancel incoming damage with a 25% chance. Monte’s third skill, Destiny Dice, will balance out the HP ratio of a chosen enemy after he rolls two dice – using the smaller number as the deciding factor of how much HP gets balanced. The problem is that if he rolls a six on both dice, then he’ll heal the enemy to 100%! The Solution: Figaro is more of an annoyance than anything, and Monte, under the right circumstances, can actually heal one of your monsters – to full HP, too, if he ends up getting two dice with a 6. I think the biggest annoyance would be Figaro, because of how he occasionally negates damage he takes, like how Garo used to be. I would say “go kill Figaro first” but it would be way easier to just go for Monte and then Figaro, even though Monte does have a chance at healing you. Once all five are killed, you can safely move on to the boss stage, where Morris and Friends™ are waiting for you! That’s right, folks; it’s boss time! Here we have the most variety in the stages, because the lackeys to Morris differ. The Threat: Because the lackeys differ, the threat differs as well. In this case, Reno is the biggest threat, next to Morris. The Solution: Thankfully, if the lackeys aren’t threatening enough, you can just go straight for Morris and be done with this stage. However, if the lackeys are giving you trouble, then go for them and then Morris. In this case, I’d go for Reno, stunlock Ludo, and then kill Morris. I hope you guys enjoyed this article, and managed to get at least one Morris copy to use in Labyrinth or something! I haven’t had time to play around with my own, but if I do, I’ll be sure to get an article delivered straight to you all! I’m Sara Ann, and I’ll see you in the next article!